Results: Finn Balor defeated The Miz; Alexa Bliss defeated Mickie James; Braun Strowman vs. Kalisto went to a No Contest; Cesaro and Sheamus won the Tag Team Turmoil to become the #1 Contenders to the Raw Tag Team Championships; Seth Rollins defeated Samoa Joe via DQ; T.J. Perkins defeated Jack Gallagher; Sasha Banks defeated Alicia Fox; Bray Wyatt defeated Dean Ambrose. Raw is in London, England this week, and that typically means two things: there’s going to be an awful lot of singing, and for the most part the show will be meaningless. Luckily that’s not completely the case this time around, even if WWE has a habit of treating the overseas shows as episodes that, in some ways, don’t have much importance when it comes to the stories being told. There’s still feuds to be expanded and matches to be had, but there’s not the same sense of storytelling. As if to underscore that point the show opens with Dean Ambrose receiving a call from Kurt Angle where, because the Olympian won’t be there, Ambrose is given the role as acting GM for the evening. Of course, The Miz won’t let that just happen so he comes out and says that he’s been told by Stephanie McMahon that he’s the Co-GM. That convoluted feeling that often comes with any sort of Authority angle is there immediately when Miz is given his role. Rather than just stick to Ambrose running the show, which could have been a great way to shake up the predictable structure, Raw ends up muddying the waters with Miz’s inclusion as Co-GM. The idea is to build tension between Ambrose and Miz, but all that’s achieved is a general sense that there’s no one controlling Raw and a fair amount of confusion as to whether it’s Ambrose or Miz who has the final say when it comes to matches. I really hope Nia Jax and Alexa Bliss are best friends forever. Love that dynamic. So because Raw with Miz and Ambrose as GM looks a lot like any other Raw, Kalisto gets another match with Braun Strowman to pay him back for, you know, getting put in a dumpster and thrown off a stage. 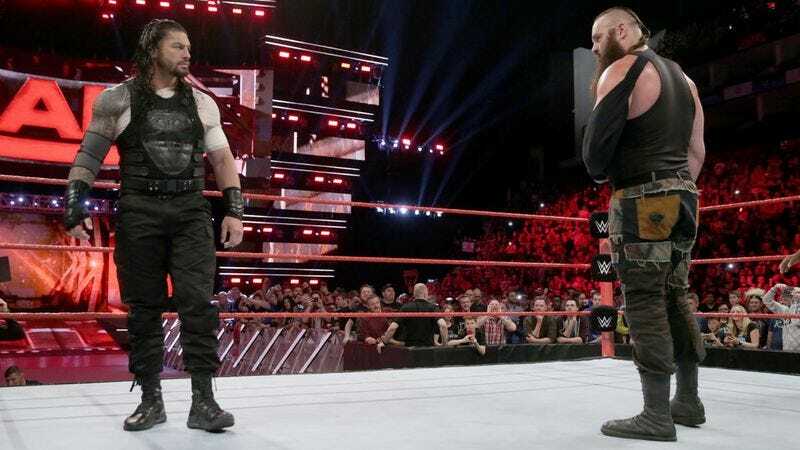 After a bit of misdirection Braun beats Kalisto down, but it’s a brief attack before Roman Reigns comes to the ring and the two start brawling. Roman gets the upper hand this time with some nasty chair shots, and it works as a good progression of this feud. The angle is that both of these men will ruin their own bodies in pursuit of destroying the other guy, and right now these two are beat up and still fighting. You can feel the hatred coming off of them, making this one of the best feuds WWE has going. Samoa Joe is kind of an intense dude, huh? His backstage promo this week is all sorts of fiery. So much spit on that microphone. While most of Raw is made up of rather inconsequential matches, the Tag Team Turmoil to determine the #1 Contenders is fantastic. It tells a number of stories, from Cesaro and Sheamus isolating Slater by attacking Rhyno before the match, to giving Golden Truth the underdog spot at the end of the match after a solid backstage promo set them up as older guys looking to “turn back the clock.” Any match that makes Golden Truth feel important must have done something right. Plus, Cesaro and Sheamus give an incredible performance and go the distance, setting them up for another showdown with the Hardys. Seriously, that Goldust pep talk before the match gave Golden Truth a purpose they’ve never had. I’d be okay with WWE following through on that, featuring those guys from week to week as they try to get their win-loss ratio back to a place that gets them a title shot. Lots of potential there. There’s nothing sweeter in professional wrestling than Cesaro stomping the life out of Enzo Amore. Of course Jack Gallagher loses in London. You do you, WWE. The main event sees Bray Wyatt take on Dean Ambrose, and as usual The Miz is wonderful on commentary. He strikes the perfect balance between putting the guys over and making sure to underline that he’s still better than they are. The match itself, along with the outcome, is a good progression of the Dean-Miz feud heading into next week’s Intercontinental Championship match. Miz feels like a guy who can get it done no matter what, and now Ambrose has all the motivation he needs to kick Miz’s teeth in.